offer and one that people come back for time after time. 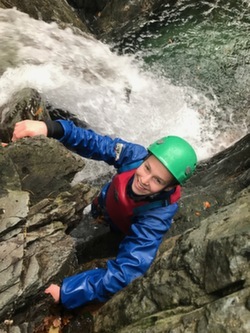 Gorge scrambling or gorge walking is an activity for all ages and for most abilities, REMEMBER - you don't have to be able to swim, we supply all the equipment and instructions to keep you above the water! if you are unsure please give us a call. Keep the gorge scramble as wet or as dry as you like as you follow one of many streams, becks and gorges. The only way to describe this activity is to say that it's like caving with the roof off! During your gorge scrambling session, waterfall climbs, tricky rock traverses, swimming through deep rock pools, rocky obstacles and plunge pool jumping are all a part of the fun. You won't believe how much fun gorge scrambling is until you've tried it! This is the third stag event I've been on with Dave and the team, and as always they didn't disappoint. Organising the event was made very simple by Kety, and our group leader Paul was first class. 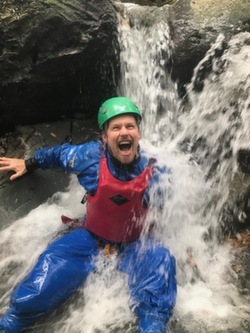 Coniston is such a beautiful part of the world, and getting to experience it through the gorge walking, canyoning and kayaking was a real pleasure. We were well looked after, the best thing about these trips is the great fun and laughter that the group leaders bring. It's always such a treat to come on these events, I can't wait to come back for more. If you've got a group event (or even as a couple), I really can't recommend these guys highly enough. We have many gorge scrambling and gorge walking venues in and around Lancashire within easy reach of Chorley, Preston, Blackburn, Bolton, Chorley, Rivington, Anglezarke and Manchester and in Cumbria, particularly around the North, South, East and the West Lake District areas, for example Coniston, Ambleside, eskdale valley, Windermere, Keswick, Hawkshead, Kendal, Bowness, Ullswater to name just a few. To view some of our Gorge walking pictures please click here scrambling images.